Steam and Amazon are back to finish off your bank account, or whatever's left of it after the holidays, anyway. There are 12 deals on Steam right now, six of which expire in three hours, among them the Left 4 Dead series, FTL and L.A. Noire. Amazon is running its "Better Than Steam Sale, involving some of the same titles at the same prices. Green Man Gaming, Best Buy and others have gotten into the act, and if you're looking to sneak in a hardware purchase in time to write it off of next year's taxes, as yours truly just did, there are some savings to be found there too. Nearly 100 deals await in this week's Moneysaver! Steam Holiday Sale began last Thursday with up to 75% off many titles through January 5th, 2013. Here are some of the best current deals that have been featured on the sale's front page, including a THQ bundle with 22 decent titles like Darksiders 2, Warhammer 40k, and Saints Row the Third. Better-than-Steam-Sale deals are plentiful this winter. Below are several games that are cheaper from Green Man Gaming. Others are the same price at Amazon, and you get a bonus $5 credit towards 2012 Editor's Choice games. Best Buy has strong discounts on console games, including the biggest price drops we've seen on Wii U titles (a few $20 off). The games below are at new lowest-ever prices or tied with their previous lows. All with free shipping or in-store pickup. Green Man Gaming has more games at lowest-ever prices thanks to savings stacking with the 30% coupon: GMG30-DPLIM-DN831. Most titles below are activated on Steam. Gamersgate has several PC bundles worth mentioning, including popular indie titles like Machinarium in the Amanita collection. Amazon continues their Digital Holiday Deals, and we've picked out a few interesting titles if you haven't emptied your wallet just yet. These below also get you a $5 credit for 2012 Editor's Choice games, redeemable in January 2013. • Civilization IV and V - Pack is $9.99, save 83 percent. • Prototype is $4.99, save 83 percent. • Bulletstorm is $3.95, save 80 percent. • L.A. Noire is $4.99, save 75 percent. • Sid Meiers Civilization V is $9.99, save 67 percent. • Spec Ops: The Line is $10.19, save 66 percent. • Darksiders II is $24.99, save 50 percent. • Dungeon Siege III is $9.99, save 50 percent. • Football Manager 2013™ is $19.99, save 50 percent. • Batman: Arkham Asylum Game of the Year Edition is $4.99, save 75 percent. • Deus Ex Collection is $15.28, save 66 percent. • Tom Clancy's Rainbow Six Vegas is $6.47, save 57 percent. • Tomb Raider: Legend is $6.48, save 50 percent. • Cryostasis is $2.70, save 79 percent. 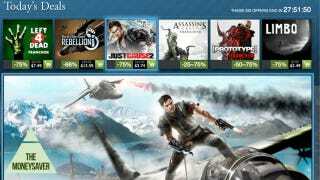 • Just Cause is $2.70, save 79 percent. • Hitman: Codename 47 is $2.70, save 73 percent. • Tropico 3 is $2.49, save 75 percent. • Metro 2033 is $6.00, save 70 percent. • Darksiders is $6.00, save 70 percent. • Warhammer 40,000: Space Marine is $9.00, save 70 percent. • LEGO Batman™: The Videogame is $6.78, save 60 percent. • Machinarium (iPad) is $1.99, save 60 percent. • Call of Duty: Black Ops (Mac) is $24.99, save 50 percent. • Botanicula (Mac) is $4.99, save 50 percent. • Assassin's Creed Brotherhood is $4.99, save 75 percent. • Prototype is $4.99, save 75 percent. • Prince of Persia Complete Pack is $12.24, save 75 percent. • Resident Evil 5 is $9.99, save 50 percent. • Dead Island is $9.99, save 50 percent.